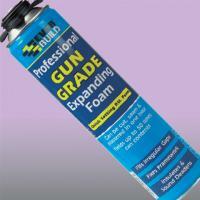 EVERBUILD GUN GRADE EXPANDING FOAM are quick setting one part polyurethane foams in aerosol form. GUN GRADE is supplied for use with our range of applicator guns. The foam expands on application to up to 50 times its original volume and expands on application by 150%. Gaps around pipe entries through walls. Gaps around window frames, door frames.